I get a lot of emails that begin something like this: "Dear Keizo, I will be traveling to Japan for the first time and would really like to visit Menya Kissou after reading yours and Exile Kiss' review. Can you please tell me how to get there from so-and-so station? Thanks!" A couple days ago I got an email from Bryan, an avid reader who is visiting Tokyo, asking if I would like to join him in trying Kissou on this hot summer day. It's been two years since my first visit and I had no plans for lunch so we were off to the most overrated ramen shop in Tokyo. I initially planned on writing this post with specific directions on how to get to Kissou just so I could reply to those emails with this link instead of writing directions each time, BUT I changed my mind. It's not worth it. Kissou is highly overrated and out of the way that you're probably better off just going to Hayashi or Fuunji or Tetsu or Harumichi or countless other gyokai-tonkotsu shops throughout the city. They're just as good, if not better. Anyway, let me tell you what happened. As I walked in the door I was told that I couldn't take any pictures. "Seriously? Is this a new policy?," I thought. Oh well, no pictures, fine. It's not like I've been asked to not take pictures before. Then while the three of us were waiting for our ramen, enjoying a casual conversation about Tokyo, we were told to shutup. Okay fine, we can be quiet. Then as I was slurping through the first third of my ramen, I noticed a strand of hair over an inch long floating next to my chashu. I normally wouldn't care, but this time I decided to say something. After showing the chef and his wife the hair, they took my bowl back and he whispered something like "I bet it's his own" into his wife's ear and gave me a dirty look. Sure, I don't have a hair that long on my entire body. Well except for...yeah whatever. Don't get me wrong, the ramen and tsukemen at Kissou are good, but I won't be going back to this overrated ramen shop anytime soon, if ever. So the next time you send an email for directions, don't hate me if I try to steer you away. From now on, I will be calling it Menya Kissyo--as in kiss yo ***. Or maybe I should call it Kissmy. Damn that sucked.. Kissamy __ is right. And they should know stuck up ramenya's were kinda of a muse for a short time in the 80's but now it's just called bad customer service, haha. i'm visiting tokyo in October and I was totally looking forward to Menya!! Really, no pictures? Any other ramen place you recommend besides Menya? Hi nelehelen. Come to Bassanova!! I went to this place once and the two people working there had to be the meanest most jaded people in the food service business. And, I use the word "service" lightly. Look at all those people waiting for hours to eat mediocre ramen made by grade A jerks. There are 1,000's of ramenya better than Kissamy...Go Basa! don't take that personally, although, I would have apologized and offered to make another bowl for you. @wall st. pundit: thanks. i won't take it personal. kissou gets a lot of idiot customers, so i can understand them. i mean, seriously: if people need to email you to get an explanation on how to reach kissou, it's obvious something is wrong with them. this info is on countless websites. 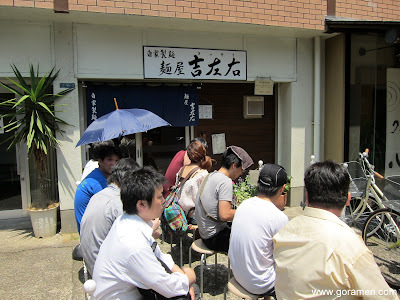 so, all the clueless tourists that wanna try "THE" best ramen in tokyo meet at kissou. no surprise they hate foreigners there. ps: also, their stuff is watery. i prefer fuunji. Thanks for the report back. What would be your curret top 3 ramen shops? You are the expert, so I trust you on this. Also: are those places (in your top 3) foreigner-friendly? If not, not to worry: I'll try to get a Japanese friend to accompany me.